More summer-like weather has visited the Mid-South over the past several days as temperatures have climbed well into the 80s daily, though humidity has still managed to stay in check. The humidity portion of the equation will change though as we head into the end of the holiday-shortened work week and the first weekend in June. If you've been paying any attention to the weather to our west, you know that severe thunderstorms and some tornadoes have been affecting the Plains the past couple of days. Similar to a week ago when Moore, OK was hit (though not as severe), the storm system producing the severe storms is a slow mover and will finally begin to have an effect on Mid-South weather as we head into the weekend. 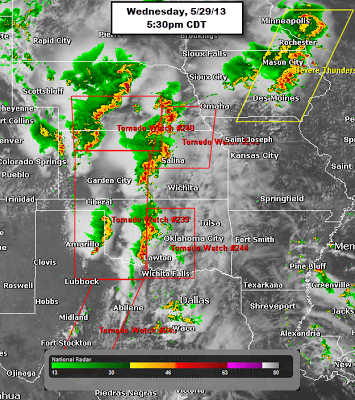 Storms over the Plains spawned multiple watches and warnings, as well as many severe weather reports Thursday afternoon. Signs that the high pressure ridge over us is weakening was evident by late afternoon radar, as a few showers and t'storms managed to pop up around the area. We're expecting more of this on Thursday as a shortwave (upper-level energy) moves over the area. Combined with moist Gulf air and very warm temperatures, scattered showers and t'storms are in the forecast tomorrow [Thursday], most of which will die out during the evening. Tomorrow's high will be in the mid 80s. We'll then turn our eyes towards the northwest, as a mesoscale convective system (MCS), or large organized cluster of storms, is expected to move toward the region early Friday morning. Though it will likely weaken as it moves closer, isolated severe weather reports will be possible to our north and we'll see small rain chances locally early Friday. That MCS will likely leave a boundary somewhere over the area, which could be the focus for a few thunderstorms during peak heating on Friday. Friday's high will be in the upper 80s. Friday night will possibly see another MCS develop and affect nearly the same areas. We could see a little better chance of showers or a t'storm with that one early Saturday as it too weakens as it reaches the Mid-South. However, with a cold front drawing closer by Saturday, more t'storms are likely to break out during the afternoon hours as highs reach the upper 80s. Again, most of this activity will be to our northwest during the daylight hours, but will move into the metro Saturday evening and overnight. There is a possibility of damaging wind or hail with these storms Saturday night into early Sunday here in the metro. The Storm Prediction Center has the area highlighted for possible severe weather in their Day 4 Day 3 outlook. SPC indicates a 30% chance of severe weather for northeast AR and far west TN on Saturday afternoon and night. Rain chances continue into early Sunday as the front slowly moves southeast of the area. Behind the front, temperatures will still be in the 80s to start next week, but not quite as warm as ahead of the front, and humidity should also dip a fair amount. This will allow overnight lows to drop back into the 60s versus the 70+ readings we are in the middle of now. Click here for the official MWN Forecast. Continue to monitor our social media channels and this blog for updates on potential severe weather concerns the next few days. MemphisWeather.net (MWN) began humbly, as a way to provide Erik's forecasts and a collection of other Mid-South-centric weather information to a slowly growing audience. The site first went live on April 28, 2003. 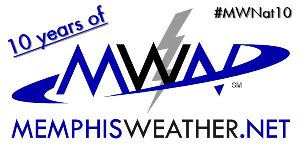 Today, MWN is the largest independent source of weather data and information in the Mid-South, attracting hundreds of thousands of visitors a year (thousands a day during winter and severe weather) with a social media audience of over 15,000 and growing. MWN Forecasts are found on the web and mobile apps and heard daily on Radio Memphis and routinely in many of our loyal followers' conversations. MWN has also been a pioneer in social media nowcasting, which is now the bread and butter of our social media strategy. In addition, our Twitter-based storm spotting program (#mSpotter) is one of only two such programs in the nation and is a key part of the public spotter program for the local National Weather Service office, resulting in verification of many severe weather warnings over the past year. 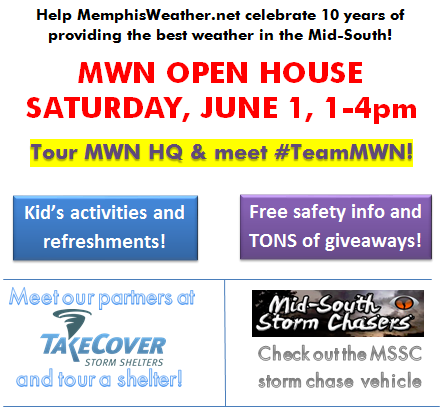 A meet-'n-greet and Q&A with current and former members of Team MWN - the folks that bring you the best weather in the Mid-South! Weather-related kid's activities, including our "Teaching Tornado"
We are asking that everyone that attends pre-register at this website for two reasons - so we have an approximate headcount and to provide you with the address of the Open House (it is on the north side of Bartlett; we are not publishing the the address to the general public as it is in a residential neighborhood). Of course, if you decide to bring a few more people along than you register, feel free! We'd love for you to introduce friends and family to MWN! Tour this MSSC chase truck at the MWN Open House! Besides the Open House, follow us all week on Facebook and Twitter as we plan to have some #MWNat10 fun there as well, including some giveaways! We look forward to seeing many of you on June 1! Spring severe weather season has been fairly quiet for much of the U.S. so far thanks in large part to an abnormally cool transition season. However, all that changed over the past week as Gulf moisture and warm air finally started moving north into the Plains. That warm-up and increase in humidity has been noticed here in the Mid-South the past week or so as well, as temps are regularly reaching the 80s, overnight lows are having a hard time dropping out of the 70s and heat indices are near or above 90 each afternoon. All of this is "setup" for severe weather once Mother Nature started bringing potent storm systems into the warm, soup-y airmass. 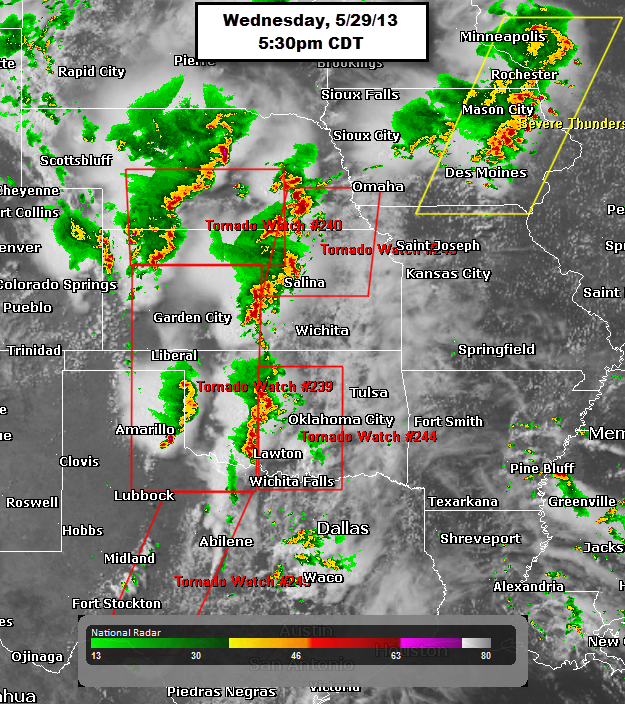 The past couple of days in the Plains have proven that the ingredients were in place as tornadoes, damaging wind, and very large hail has occurred to our west. 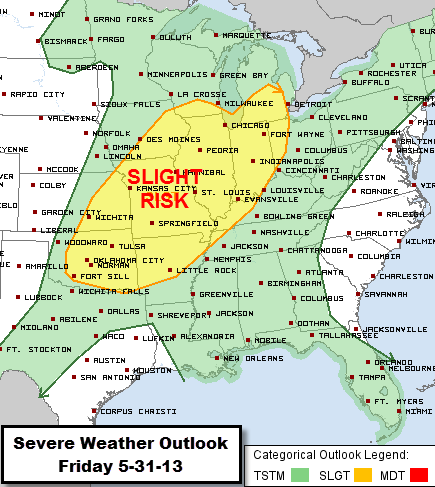 As the slow-moving storm system responsible for the Tornado Alley storms shifts east, the threat of severe weather moves with it. Storm reports received by the NWS on Sunday. Over 400 severe weather reports were received . As of mid-day Monday, the Storm Prediction Center has issued a Slight Risk for all of the Mid-South for the possibility of severe storms on Tuesday afternoon and night. The higher risk of severe weather, a Moderate Risk, extends from central AR into northeast TX and does not currently include the Memphis metro. 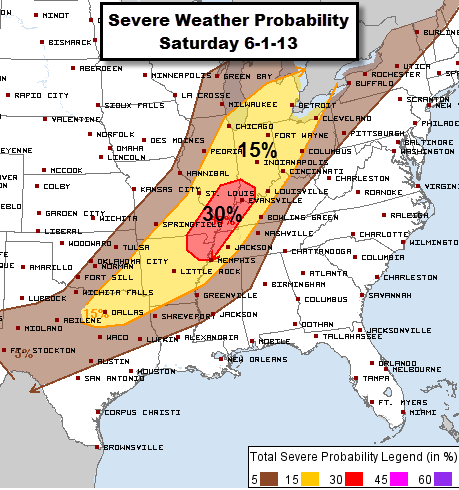 The probabilities map that SPC issues, and is shown below, provides the chance that severe weather will occur within 25 miles of a point on the map. For most of the metro, except the eastern sections, there is a 30% chance of severe weather (1" hail, 60 mph wind, or tornadoes) Tuesday and a 15% chance east of the Bluff City. The highest probabilities (45%) correspond with the Moderate Risk zone above. 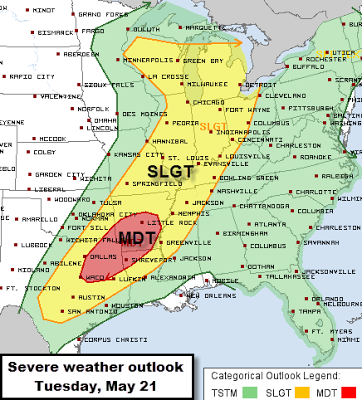 In addition, the western part of the metro (Memphis to Tunica and west) is on the border of a "significant severe" area (what we call the "hatched area" in the business, as it is noted on the map with a black hatching). 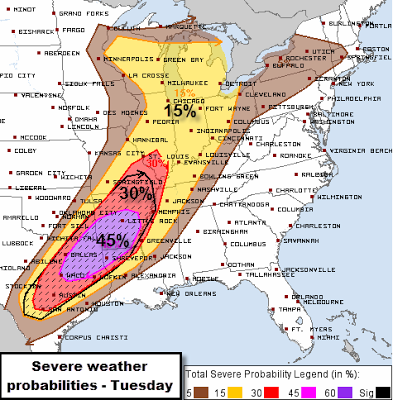 This means that there is a 10% or greater probability of significant severe weather within 25 miles of a point. "Significant" severe weather is EF-2+ tornadoes, 75+ mph wind, or hail 2" in diameter or larger. Remember that a Slight Risk does NOT mean the storms will be slightly, or borderline, severe, only that severe storms are not expected to be widespread, but will very likely occur. )We believe the term "Enhanced Risk" or "Elevated Risk" would be more appropriate.) More widespread severe weather is expected in the Moderate Risk zone, which is shown by the probabilities map. Click here for more information on risk zones and their meaning. Overnight tonight, storms in AR will rapidly fall apart as they move east across the state, leading to perhaps a few showers in the morning locally. However, heating of the day (highs in the upper 80s) and plenty of moisture/humidity (dewpoints near 70), along with some wind shear, will promote new storm development to our southwest during the afternoon. A few showers or a weak thunderstorm are possible in the afternoon in our area, but a "cap" of warm air over the lower atmosphere will keep things from getting out of hand. As we head towards the evening, the storms to our west will move east or northeast into the region. Some supercell storms, especially west of the river, could produce tornadoes. However, we expect that storms will become more linear as the sun sets and one or more squall lines will be what we deal with locally. These storms will be capable of damaging straight-line wind, large hail, and an isolated quick-hitting weak tornado. If discrete cells make it into the metro in the evening, the tornado risk would be higher. The most widespread storms are likely to occur after 8pm Tuesday (perhaps even a couple of hours later) and last for several hours. 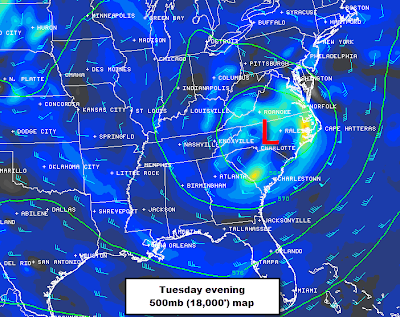 In fact, general thunder could occur throughout the nighttime hours into early Wednesday. In addition to storms, there is a threat of very heavy rain producing some flash flooding Tuesday night. With any luck, a good part of Wednesday will be precip-free. 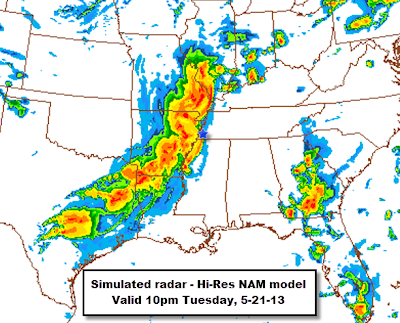 Hi-resolution model data showing "future radar" that indicates a large area of storms could be moving into through the metro (Memphis is blue star) at 10pm Tuesday. THIS IS A MODEL, NOT A FORECAST. Prepare ahead of time for the possibility of severe weather after dark Tuesday night. 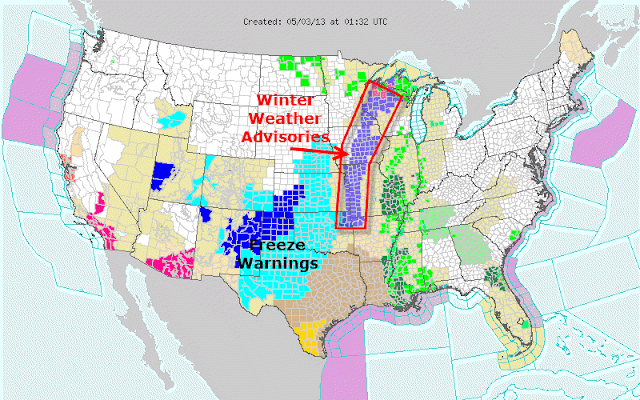 Have multiple ways to receive severe weather information, especially if you are asleep. Weather radios or smartphone apps like our StormWatch+ severe weather notifications (link below) are a good way to receive info that will wake you up. Outdoor warning sirens are NOT. Anytime severe weather is possible, we'll provide you with the latest via our social media feeds. Check those out below if you haven't already. Quick post on the likelihood of storms tonight. A cold front will approach the region and generate an area of thunderstorms that will move out of central TX across southern AR/northern LA and into MS overnight. Meanwhile, additional showers and t'storms are likely further north ahead of the front as well. Amongst all of this activity, we are left with a high likelihood of rain and thunderstorms overnight. Most of the rain will fall after dark, with the heaviest activity after midnight. Some heavy rain is likely and a strong wind gust is possible, though SPC (and we agree) thinks that any severe weather should stay to our southwest. Just don't be surprised if thunder wakes you (or your pet) up tonight! Showers and t'storms will continue to be possible throughout the day Friday, though the heaviest rain and most concentrated activity should move out by mid-morning. Don't make a lot of outdoor plans that are weather-sensitive on Friday however! We'll keep you apprised via our social platforms, listed below. We've blogged before about the dangers of tornadoes in Dixie Alley. 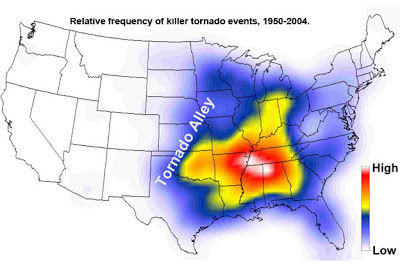 As shown above, the frequency of killer tornado events is at a maximum in the Mid-South. Now another source lends credence to the danger of Dixie Alley tornadoes. Recently, The Weather Channel published a ranking of the Top 10 Tornado Cities. The ranking was based on track length and path width of tornadoes within 75 miles of the city between 1962-2011. They describe the cities on this list as places "where homes are most likely to get hit". Despite the fact that the stats used in this compilation very likely don't take into account that path widths change as a tornado travels along the ground (resulting in an overestimate of the area affected), that probably has little overall effect on rankings. 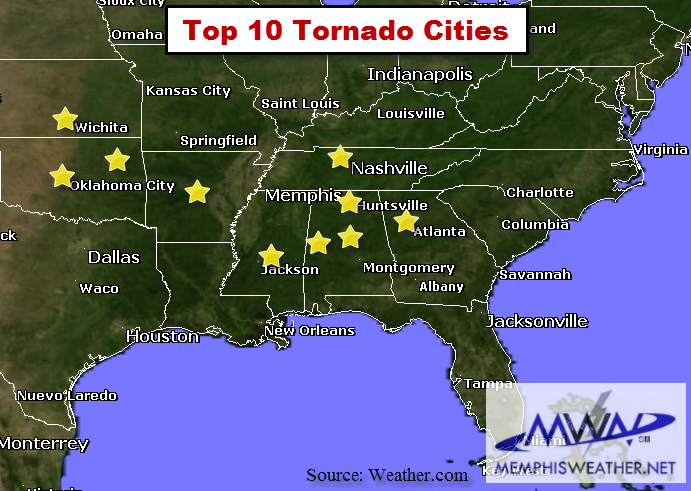 The list includes only 3 cities from the traditional Tornado Alley, while 7 cities are in the southeast and the top 5 are all in Dixie Alley. While Memphis is not on the list (no complaints right? ), Little Rock, Nashville and Jackson, MS are, as are 3 cities in Alabama. What do you think? Are there any surprises? Cold and wet. Temperatures averaged below normal during April, while precipitation was above normal. For the year, precipitation is above normal by almost 5" and more than twice as much rain has fallen in the first 4 months of 2013 as compared to 2012. Temperatures so far in 2013 are averaging about one degree below normal. Severe weather occurred on April 27 as an EF-1 tornado touched down in far northwest Fayette Co in the community of Belmont. However, for the month, only two tornadoes occurred in the entire NWS-Memphis warning area (map of area below), despite historically being the most active tornado month in the Mid-South. Climate details for April can be found below. The average temperature for the month of April was 61.2 degrees, or 1.7 degrees below normal. The average high temperature was 71.7 degrees and the average low was 50.6. The coolest temperature of the month was 39 degrees on the 25th, while the highest temperature was 86 degrees on the 17th. A record high minimum temperature record was set on April 16th when the low only dropped to 69 degrees. Precipitation for the month totaled 6.88", which was 1.38" above average. There were 10 calendar days with measurable rainfall, five of which recorded at least 0.5" and two which saw 1" or more. The maximum 24-hour rainfall was 3.01" on the 10th-11th. The peak wind gust was 43 mph from the northwest on the 18th with an average wind speed for the month of 8.9 mph. Click here for a daily statistical recap for Memphis International Airport. The average April temperature at Cirrus Weather Solutions was 60.4 degrees with a maximum of 87.9 degrees on the 17th and a minimum of 34.9 degrees on the 25th. April precipitation measured 6.76" via the Cirrus automated gauge and 7.03" in a manual gauge used for the CoCoRaHS program. The measured peak wind gust was 24 mph on the 18th. Average relative humidity was 71%. Click here for a daily recap on MemphisWeather.net. For the month of April, the average temperature error in all MWN temperature forecasts was 2.71 degrees, lower than all available computer model data and the National Weather Service forecasts. More than 52% of the MWN temperature forecasts for the month were within 2 degrees of the actual temperature. MWN's forecasts extend out five periods (2.5 days, or roughly 60 hours). For dewpoint accuracy, the MWN forecast averaged 2.77 degrees error and fell within 2 degrees of the actual dewpoint over 52% of the time. Historical accuracy statistics can be found here. With Beale Street Music Festival over we can look back and reflect on the rain that inevitably occurred during the festivities. Although Music Fest is not always rainy, it certainly feels as if it is and this past weekend certainly did not help that image. In addition to plenty of rain, it was unseasonably cold. Record breaking cold even, as record lows were set Friday (37) and again Saturday (36). The low of 36 also set the record for the coldest temperature ever recorded in May, breaking the previous record of 38 set on May 7, 1944. All of this activity was associated with a potent upper-level low pressure system that moved very slowly through the region. The strength of this system was certainly uncommon for this time of year, and it helped to bring the record breaking weather to the region. With the departure of the aforementioned upper-level low, temperatures have warmed up quite a bit - into the 70's today - and highs are expected in the 80's the rest of the work week. Nights are also expected to be fairly mild with lows in the 60's. However, Thursday night into Friday, chances for rain and thunderstorms return with even a small possibility of severe storms on Friday that we will be monitoring. This rain is associated with an upper-level disturbance plowing its way south out of Canada. The majority of the rain is expected to occur Friday, with smaller chances from the departing system on Saturday. Spring-like weather returns Sunday and continues into next week, with highs in the 70's and lows in the 50's under mostly sunny skies. This spring-like weather is primarily due to an associated surface cold front accompanying the upper-level disturbance, which will shift winds to the north and allow cooler, drier air into the region. May sunshine will keep temps from getting too ridiculous though! No more 30s until late fall! Temps and wind for the next 7 days (GFS model) - wind shifts to southerly tomorrow, then back to northerly on Saturday as temps cool. Early next week, they shift back to south and temps warm back up. A very unusual pattern for Memphis in May - cold and wet! It's not unusual to see a rainy first weekend in May for Beale Street Music Fest as many who have been will attest to. However, the pattern we are in for this weekend is very rare. That pattern features a strong upper-level low pressure system moving directly over the Mid-South that will bring a chance of record-breaking COLD air as Canadian high pressure trails it. This type of pattern is one that, were it to happen a month ago, would bring us an April snowfall. Instead, the snowfall stays just to our west - believe it or not, places as far south as northwest AR are expecting May snowfall accumulation! The short animation above shows the upper-level low as it moves over the region this weekend (video begins Friday morning and steps forward in 3 hour intervals through Monday mid-day). The map below shows Winter Weather Advisories stretching south into the Ozarks, while Freeze Warnings stretch to the Rio Grande area of Texas bordering Mexico! So what can we expect here? Rain - and a lot of it in the next 24 hours - as well as temperatures that are MUCH too cold for May. With the low moving directly overhead, an unsettled cold pattern will mean the chance of showers until Sunday, though after midnight Friday night, the chances drop a great deal. We expect to see scattered showers, especially during the afternoon hours Saturday and Sunday. As far as temps, tomorrow's high will occur tonight at midnight and fall from there. We expect to see mid to upper 50s at rush hour in the morning, falling to near 50 by the afternoon rush hour. If it weren't for the overnight "warmth," the record low maximum temperature for tomorrow of 56 could have been in jeopardy of falling. The daytime high will likely be around that number. The record low Saturday morning is 40 and that is what we are projecting for an actual low. (In case you're wondering, the coldest temperature ever recorded in May in Memphis is 38 - we'll get close!) Saturday's high of 57 will be a few degrees above the coolest maximum temperature for the day (53), then Sunday morning's low of 45 will also come within a couple degrees of the record of 43. A quick warm-up takes place next week as the low departs and highs top out near 80 again by mid-week! So if you're heading to BSMF this weekend (or the Grizzlies game tomorrow night), prepare for cold weather and plan on mud, if not rain, especially Friday night! 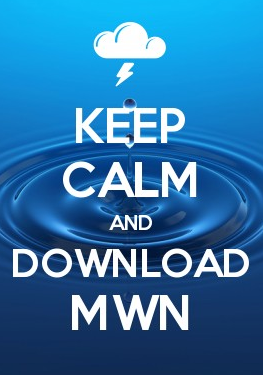 You can keep a close eye on all local weather info by taking our MWN app with you! Links are below. The app contains our always-current MWN Forecast, which you can also find here.